Every snowflake is unique. Mercedes-Benz wants it’s customers to know that every AMG engine is unique too. Using engine parts, visitors to the new Mercedes-AMG Snowflake Creator, can move around engine parts into various repetitive designs to generate their own snowflake to send it to their friends along with a message. I’m thinking I should send one to my wife letting her know what I want for Christmas – a $194,700 AMG SL 65 Black Series. She can skip the giant red bow. The snowflake creator is a somewhat interesting execution. It’s not particularly entertaining as you only have five auto parts and an AMG logo to create your masterpiece, but adding more parts isn’t really necessary. 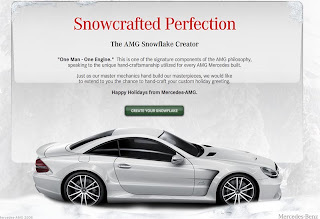 What is interesting is taking the idea expressed on the homepage, “’One Man – One Engine.’ This is one of the signature components of the AMG philosophy, speaking to the unique hand-craftsmanship utilized for every AMG Mercedes built.” We all know snowflakes are unique. (Or are they?) Bringing together an idea we all understand, take a symbol of the holidays, and mesh it together back to your brand’s desire to communicate the uniqueness of your product. It is a compelling message and a great way to reinforce the special quality of AMG. Sending an email works well at a time when people are exchanging e-cards over the holidays. I like it when companies can find a way to make the holidays relevant to their marketing efforts. Besides, I’m sure it’s more welcome than getting this e-card. The site doesn’t let you save your snowflake as an image or post it on your social networking page, but that doesn’t seem necessary as this is a holiday card application and who really needs an picture of your “unique” creation. It’s about creating a card that is uniquely you though it isn’t communicated to the person receiving your e-card that the snowflake is part of the AMG philosophy of being handcrafted and unique. It just looks like the typical Christmas e-card with some strange looking circle floating down to the hood of a Mercedes. So, the message of the site is lost when sent along to your friends. Overall, it’s a nice execution and a timely way to demonstrate the uniqueness AMG is reinforcing about their products. more.